It started with a funeral. It ended with an economy class seat and in-between was a bit of a classic would be the short form of this review. Long time readers will know that I don’t do short, I tend to ramble on and on and on with flights of fancy – so I won’t disappoint here. But it does start with a funeral (you can hear part 1 for free here) – its the funeral of one “Lefty Lonnegan”, half human half cyborg crime boss, retired to the “costa del crime” planet of Ricosta, Lonnegan is also the erstwhile partner of one Sabalom Glitz who is also the erstwhile business partner of one Melanie Jane Bush. Yes, this is the story where Mel (Bonnie Langford) comes back. 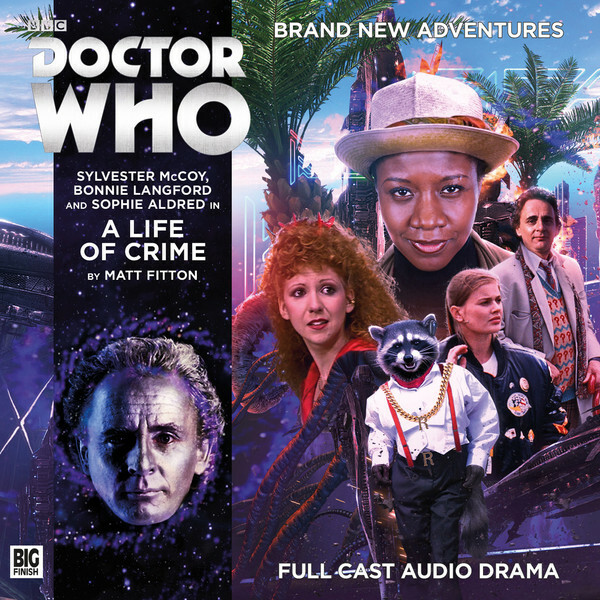 I know she has never really been away as she has been a star with Big Finish since almost the beginning – and they have made her a much more rounded and likeable character than she was on TV. But this is the story set after her final appearance in Dragonfire and where we find out about the intervening time with Glitz. But its not just about Mel, oh no, its a lot more complicated than that – this is a story of two halves, what starts as a long con turns into an invasion story. It also has a non linear story structure with Mel’s thread and The Ace/Doctor threads happening at different times and then dovetailing quite nicely at the end of part two. So the plot – there really is not a lot I can say without giving away spoilers, there are criminals, a bank job, a rather vile species of alien banker called the Speravores who delight in absorbing the potential futures of their victims. Unlike the TV series the non linear narrative works to the stories benefit and fit together perfectly, logically and as a listener I felt rewarded and enlightened rather than frustrated and cheated. But this is Mel’s story really – and there is a knockout scene between her and The Doctor where they discuss how each other have changed in the intervening time, Mel expresses her disappointment at the machiavellian path that Seven has taken whilst the Doctor is appalled at how Glitz has apparently been a bad influence on Mel. But sometimes in a friendship you have to dig beneath the surface to fins out real motivations as the Doctor & Mel both find out. And as this is Mel’s story, I have to give praise to Bonnie Langford as Mel, a more worldly wise, wily and less perky Mel, a more mature Mel. She has changed, we all change, but she has changed whereas Ace is very much the same calling Mel “Doughnut” much to Mel’s annoyance. What begins great caper of a story reintroducing and updating a classic companion and giving her some very believable character development ends as an exercise in cause and effect and a ride in economy class – but this story is most definitely business class 9/10. This title was released in July 2016. It will be exclusively available to buy from the BF website until August 31st 2016, and on general sale after this date. Some other former associates of Ms Bush are abroad in this space Costa del Crime, however. Not long ago, the time and space traveller known as the Doctor arrived here, alongside his sometimes-criminal associate, the reformed juvenile offender Ace. But now the Doctor’s gone missing – and Melanie Bush is about to learn that on the planet Ricosta, the wages of sin… are death. Sylvester McCoy (The Doctor), Bonnie Langford (Mel), Sophie Aldred (Ace),Ginny Holder (Gloria/Secretary), Des McAleer (Lefty Lonnigan), Stephen Hagan(Nathan Later), Harry Myers (Atomon/Sperovore Banker/Steward), John Banks(Mayor/Sperovore Auditor/Sperovore Financer). Other parts portrayed by the cast.